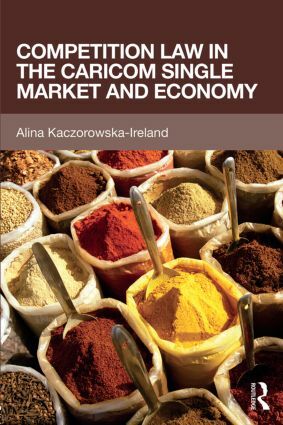 Competition Law in the CARICOM Single Market and Economy provides a comprehensive introduction to and overview of this emerging area of law, discussing both the current context and potential directions for future development. The book provides an account of major topics in the law, including the economics of competition law; enterprise; enforcement; regulation; and obligations of member states. It traces the progression of the law from the 2006 Revised Treaty of Chaguaramas, charting the main developments such as the establishment of CARICOM Competition Commission (CCC), and examining the emerging case law in this important and fast-growing area. Offering the first major exploration of Caribbean Competition law, this text will be an essential resource for lawyers, businesspersons, and students of the law in the Caribbean. Alina Kaczorowska-Ireland is Professor of International and EU Law at the University of the West Indies, Cave Hill Campus, Barbados.